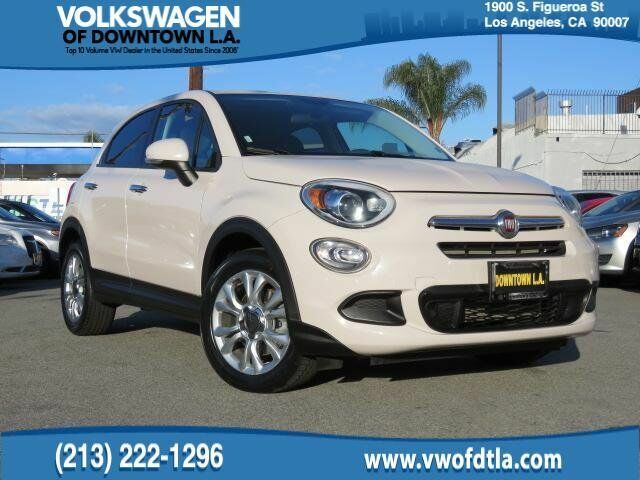 Bianco Gelato (White Clear Coat) 2016 Fiat 500X Easy MULTI POINT SAFETY AND MECHANICAL INSPECTION PERFORMED BY CERTIFIED TECHNICIAN, FRESH OIL CHANGE, NEW BATTERY, NEW WINDSHIELD WIPERS, DETAILED INTERIOR/EXTERIOR FOR DELIVERY, Bluetooth Hands Free, 500X Easy, 2.4L I4 MultiAir, 9-Speed 948TE Automatic, Bianco Gelato (White Clear Coat), 17" x 7.0" Aluminum Wheels, 6 Speakers, Brake assist, Delay-off headlights, Electronic Stability Control, Quick Order Package 27D, Remote keyless entry, Security system, Spoiler, Steering wheel mounted audio controls, Turn signal indicator mirrors, Variably intermittent wipers. CARFAX One-Owner. 22/31 City/Highway MPG FWD 2.4L I4 MultiAir 9-Speed 948TE Automatic Clean CARFAX.